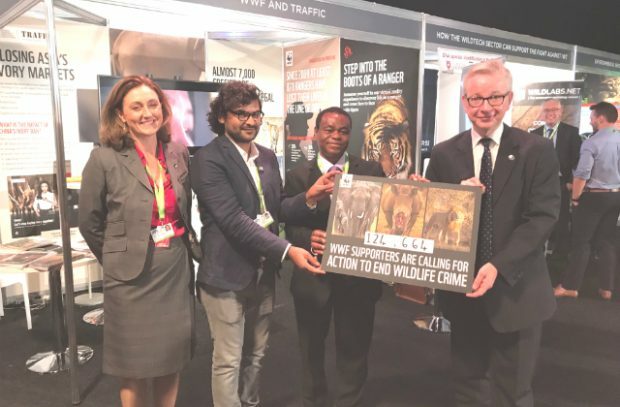 Environment Secretary Michael Gove accepted a petition from the WWF with more than 120,000 signatures demanding action from global leaders to end wildlife crime. There is extensive coverage this morning of the London Illegal Wildlife Trade Conference 2018, which kicked off yesterday and continues today (Friday). More than 70 countries were represented on day one of the conference, where the government announced £900,000 of new funding for counter-poaching training in Africa. The conference was also well-attended by charities, conservation groups and businesses. Much of today’s coverage focuses on the Duke of Cambridge’s speech at the opening session of the conference, in which he made a passionate plea for countries to devote more of their resources to tackling IWT. Earlier in the day, Environment Secretary Michael Gove also announced the members of a new Ivory Alliance 2024 to tackle international demand for ivory. The conference continues and day two has already been kicked off by BBC Radio 5 Live presenter Nicky Campbell and teenage actor and UN Goodwill Ambassador Aidan Gallagher introducing the opening speech from Mr Gove. Later today countries will sign up to the London 2018 declaration, committing to action to protect endangered species around the globe. Keep up to date with all the latest news and announcements from the conference on our dedicated Illegal Wildlife Trade Conference gov.uk page.